The School has a number of excellent visiting music teachers who offer one-to-one instrumental tuition. Pupils can take one thirty minute lesson each week in the dedicated music teaching rooms. On average, around two thirds of the pupils learn a musical instrument within School time. 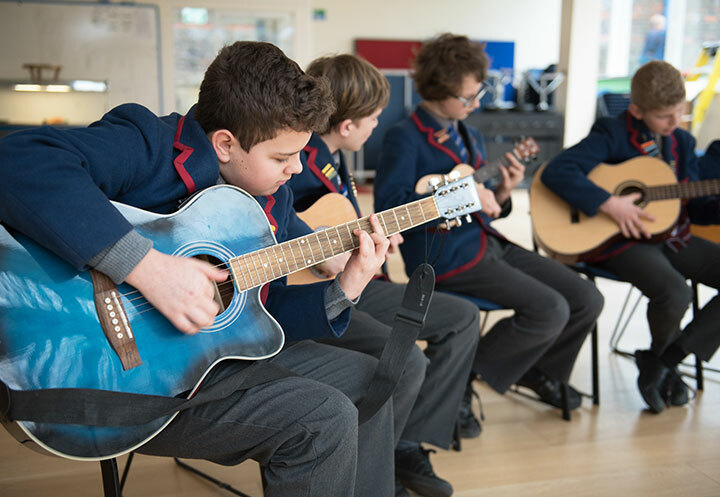 Pupils are withdrawn from their normal lessons, but the instrumental lessons are rotated wherever possible each week, so that boys do not miss the same lessons each time. Instruments usually available include: piano, violin, clarinet, saxophone, flute, trumpet, guitar (acoustic and electric), drum kit and 'cello. Voice lessons are also possible. Parents interested in their son taking up an instrument should contact the Director of Music. Tuition fees are payable in advance each term, and a full term's notice is required in writing for withdrawal from lessons. Many boys take formal grade exams, but this is not a requirement. Boys who learn an instrument within School may also participate in School concerts, and join the orchestra or instrumental ensembles.